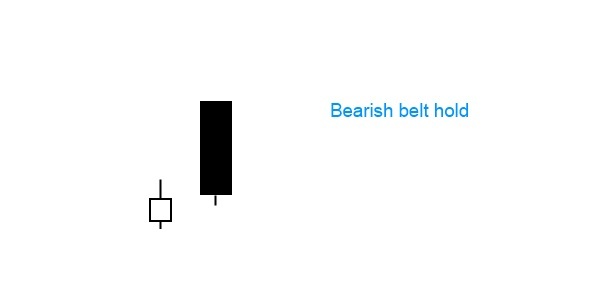 Bearish belt hold is a single bearish reversal pattern, appearing in an uptrend. In this pattern, the day opens at its high level, but then price falls and closes near its low, not necessarily at the lows of the day. The candle is a black opening marubozu. It has very small lower shadow but no upper shadow. What to do when a bearish belt hold pattern forms? To a degree the significance of the formation is fairly obvious; an uptrend is broken by a strong days move. Thus the larger the black candle, the stronger the probability of reversal. Traders will typically wait for further signs. A confirmation with either a black candle, large gap down or a lower close on the next day can be used to initiate short positions. Conversely, a bullish belt hold pattern turns up in downtrend and is a potential bottom reversal pattern. Both belt hold formations are more notable when they form part of other candlestick patterns, e.g. the dark-cloud cover pattern or the engulfing pattern.